Why did the gopher tortoise cross the road? Video by John S. Quarterman, Coppage Road, Lowndes County, Georgia, 18 August 2011. To find a way through the fence. 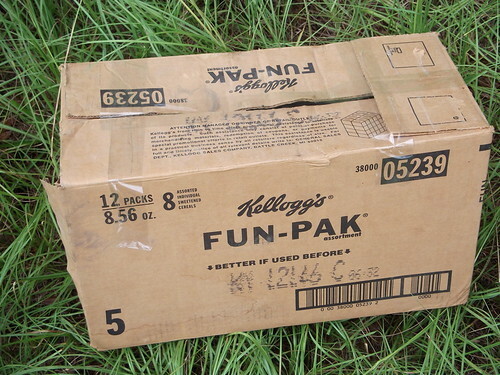 What's in the fun box? Well, that looks like fun! 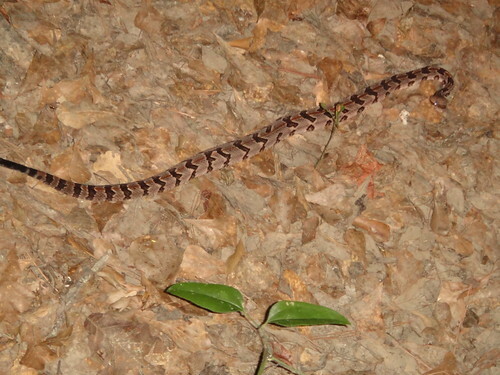 Yep, it's a timber rattler. 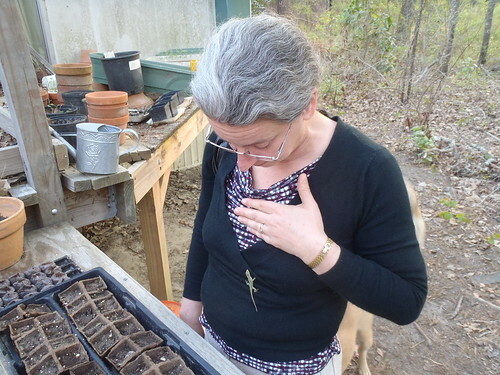 You can't see the rattles in this picture (although you can in these other ones by Gretchen), but it had three. So I put it in a box. It didn't like that: it really rattled. We drove it to a better spot in the woods, where it's very happy now. Good dogs, Yellow Dog and Brown Dog! They notified us but did not try to bite the snake. Pictures by John S. Quarterman and Gretchen Quarterman, Lowndes County, Georgia, 1 June 2011. Update 8:45 AM 3 July 2011: Fixed picture link and added link to flickr set with Gretchen's additional pictures. 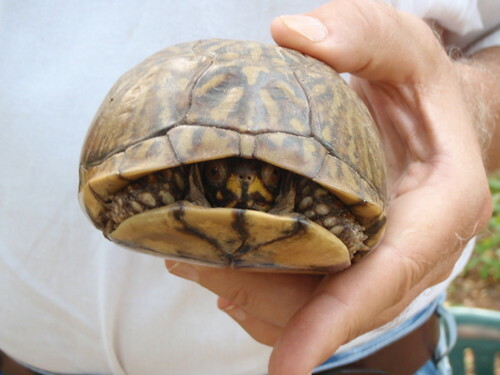 It's a box turtle. Presumably either the eastern box turtle, Terrapene carolina carolina, or possibly a Florida box turrtle, Terrapene carolina bauri. She did not like it in the sink. She likes it fine but where she drinks. Not with water, it would get wet! 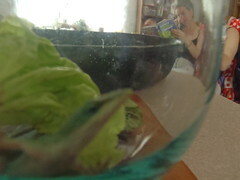 In a glass with leaves, it can't get out. 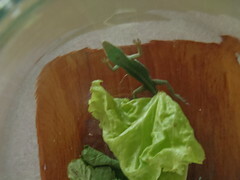 The lizard didn't like the leaves. "I'm a carnivore," it said. "Could you let me out to play?" So we let it out, but it thanked Gretchen first. Gretchen was very amused to see me do the snake dance. 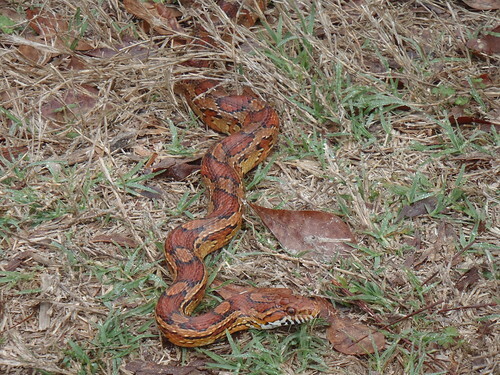 This corn snake was lying in the path at the edge of the field, and I almost stepped on it. Probably it was sunning itself to get warm. It's harmless, except to small rodents that live in corn fields. Elaphe guttata is a constrictor. This one was 3 or 4 feet long. They're native to the U.S. southeast from New Jersey to Texas. I did not know until that day that corn snakes can climb trees. 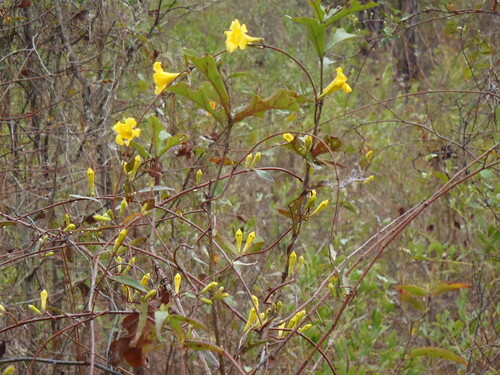 a high-climbing, woody vine that is known by several names, including Carolina jessamine, poor man's rope, or yellow jasmin. It smells good. It's native to the U.S. southeast. Pictures by John S. Quarterman, Lowndes County, Georgia, 28 February 2011. 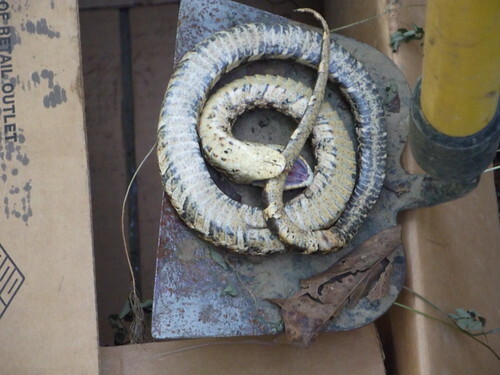 The dogs caught this snake and put it in the driveway where we'd be sure to see it. Pictures by Gretchen Quarterman, Lowndes County, Georgia, 10 Sep 2010. It's just a log, right? So why are the dogs so interested?